FUNERAL SERMON OUTLINE provides an example of a funeral sermon outline that is sensitive to the needs of the bereaved. A funeral sermon outline that is sensitive to the needs of the bereaved usually follows a progressive structure of seven parts. As the representative of the bereaved family, you need to begin the service by welcoming the people and by introducing the deceased person. The best way to introduce the deceased person is by sharing a little about the life of the deceased person. If it is a Christian funeral, it is important to finish the introduction with prayer. Generally speaking, most funerals (non-Christian or Christian) do not mind if you read a text from the Scriptures. For a Christian funeral, the text would focus on the funeral message. Telling the life-story of the deceased is part of the eulogy. A family member may want to present the eulogy. For more information on how to write a funeral eulogy speech, click on How To Write A Funeral Eulogy Speech. Sharing some memorable moments of the deceased is one way for people to come to terms with the death of that person. In fact, it seems that sharing in a funeral service can be therapeutic. Furthermore, it helps people come to terms with their loss. Praying for the bereaved family is comforting and encouraging. However, it is important to keep this prayer short and sensitive. For more information on funeral prayers, click on How To Write Funeral Sermon Prayers. The message will depend upon the deceased. Nevertheless, the message should be encouraging. In light of a Christian funeral, the message is words of hope because the deceased person is with Jesus Christ. Sharing the gospel message of hope is expected at a Christian funeral. In light of a non-Christian funeral, the message needs to be sensitive to the non-Christian. However, you can present the gospel of hope in Jesus Christ in a indirect way. Most people have music at a funeral. Again, the music will depend upon the deceased. I have found that both Christian and non-Christian funerals appreciate a closing benediction. In the benediction, you simply bring the funeral service to a close. Funeral Sermon Outlines is another place where you can get ideas for funeral sermons. Reading other funeral sermons is another way of getting ideas for funeral sermons. 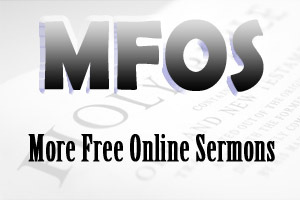 Click on Free Funeral Sermons. There are many different facets to writing a sermon. How to write sermons will help you develop ideas for writing funeral sermon outlines.